President Barack Obama’s recent state visit to India attracted scant notice in the U.S. press. The South Asian subcontinent is a place with seemingly little direct impact on major U.S. concerns today, like the economy, terrorism, Middle East conflicts, divisive racial issues, Ebola, and ever more destructive weather events attributed to climate change. For India’s prime minister Naredra Modi, and a broad spectrum of the Indian population, Obama’s trip was regarded as a major event, and his well-received sojourn signaled renewed strengthening of U.S.-India ties, which in some areas had been strained in recent years. As the world’s most populous democracy, home to over 1.2 billion people; and the third worst polluter of the global environment; just behind the U.S. and China; as a nuclear power; and as a nation with a rich and ancient culture that grapples with the relatively recent onslaught of real estate and industrial development, India is a place that ought to hold more fascination for Americans than it apparently does. India, it seems, has a serious image problem. When most Westerners think of places in India like Calcutta, it’s the squalid neighborhoods and impoverished masses struggling to eke out an existence that most often come to mind. The city, a Bengali metropolis of 15 million, is hardly a major tourist destination. As I recall an extended visit to India some years ago, our stay in Calcutta was enthralling, but it was one of the most difficult and exasperating places I’ve ever visited. While the city is as visually and intellectually stimulating as many other places in India, the problems of overpopulation and extreme poverty that one is faced with virtually every waking moment of every day thwart any kind of reverie. For that reason, The Home and the World: A View of Calcutta, Laura McPhee’s latest book of photographs, struck me as something extraordinary. Taken in Calcutta, or Kolkata, as it is now named, during extended visits over the past seventeen years, McPhee’s colorful and elegant pictures of Bengali people and architecture convey a surprising calm and solemn dignity that differ significantly from my experience, and from familiar images of the teeming metropolis. The book, with essays by scholar Romita Ray and novelist Amitav Ghosh, convey McPhee’s special relationship with the city and an unusual point of view. She uses a cumbersome Deardorff 8×10 view camera to render exquisitely detailed shots of local denizens and historic buildings that have a rather wistful feel. Yet she doesn’t romanticize or idealize the place. She avoids the usual hierarchy of the photographer’s willful imposition of his or her vision onto subjects and surroundings. The New York-born Boston native approaches the work as a collaborative effort with subjects and consultants who are in total compliance with her aims. The results are intimate and very personal. In a recent phone conversation with the artist who was in Kolkata, I asked about her approach to her work and her feelings about this astonishing place. David Ebony What were your impressions of Calcutta on your first visit? How did it differ from your expectations? Laura McPhee I first visited Calcutta in 1998, on a Fulbright scholarship. Like most people, I had images in my head of Mother Teresa, and of the extreme poverty and the teeming masses. But I found Calcutta to be quite different. It’s the kind of place where you come to expect the unexpected at all times. There are extremes of poverty, certainly, and there’s extreme wealth, too, especially intellectual and cultural wealth. There’s great interest here in books, music, films, theater and the visual arts. It is quite a lively scene. But it’s hard to access it when you first come here. Kolkata is one of the most visual places in the world. It can be overwhelming, but you have to take it slowly and find your way into it. You have to spend enough time here because there’s a certain process in getting to know it. Each day, there are unexpected, chance encounters that make it special. Ebony In 2001, Calcutta’s name was officially changed to Kolkata? Why? What’s the significance? McPhee The English called it Calcutta, and English speakers still say, Calcutta. But in Bengali, it’s always been Kolkata. Like Bombay’s name change to Mumbai, it’s just a return to Indian languages. I use both names, sometimes interchangeably. Ebony Why do you use an antique Dearorff 8×10 view camera? McPhee I use it because I still haven’t been able to find another camera that renders the world in that particular way. I haven’t been able to find one that is as satisfying. The beauty of the 8×10 view camera is that the negative is so large it shows things that the eye doesn’t see. When you see the negative and make a print, you have the sensation of seeing something for the first time. Because the image is so detailed, it reveals the complexity of the world. Ebony What are your thoughts about Rabindranath Tagore’s 1916 novel, The Home and the World, and why did you reference it in the title of your new book? McPhee I admire Tagore and Satyajit Ray [renowned Bengali director of a 1984 film based on the novel]; they are central to the intellectual history of this city. And I wanted to reference both of them by using this title. The Home and the World is a very personal story and deals with family, and that was important. There is a kind of intimacy to the story, and it was an inspiration for me in trying to tell stories about family and family history through the photographs. Ebony In her essay for the book, Romita Ray discusses how in your photos “the sacred is continually interwoven with the secular and material worlds.” Is that a conscious aim on your part? Can you comment further on that idea? McPhee I think that in India in general, the sacred is continually interwoven with life in that way. No matter what you’re looking at you’re aware that there’s some offering involved; you see offerings on the street, on the sidewalks. Many people start off their day by making an offering. For me, the idea of the offering is central to my experience of India, and Kolkata, and also in making my book; I wanted to reflect that idea somehow. When you open the book, the first thing you see is an offering of flowers for the Durga puja celebrations, and the book closes with that image. The book itself is organized as a kind of offering. Ebony A particularly interesting passage in Romita Ray’s essay deals with the images of glass chandeliers in your work, especially as they appear in tents during the Durga puja festival. What is the significance? McPhee The 18th- and 19th-century houses that you see in the photos were built for Indian owners and occupants. They weren’t built for the British colonialists, and it’s important to note that. They imported a lot of English and European decorations for the houses, though, and often things like chandeliers. The use of chandeliers in tents during the Durga puja festival has a kind of symbolic significance. Durga puja is a huge Hindu celebration that happens here every year in late September or early October. For the festival, the locals create about 2,000 installations in the streets all over the city. It’s the most spectacular thing I’ve ever seen. Some have incredible detail, like marble facing and the chandeliers, and it’s all for just for four days. Originally, people celebrated Durga puja indoors, in their homes and in the temples. But slowly it changed and now it’s celebrated more in the streets. The chandeliers in the tents indicate the link between the home and the street—the public and private. It represents the evolution of the festival from the house to the street as a kind of democratization of the celebrations. Ebony Your vision of Kolkata is rather intimate and personal, quite distinct from typical images of the crowds of people and the impoverished neighborhoods of the city that we usually see. Was this a conscious decision? Why have you taken this approach? McPhee It was definitely a conscious decision. I guess when we bring images of India to mind it’s very easy to see the same images over and over. I didn’t want to take the pictures that fulfilled the expectations of most people–including me in the beginning! I deliberately avoided that approach. When I started to photograph people, I wanted to make the pictures very formal portraits that were clearly collaborations between me and the person. That’s why I love to use the 8×10 camera. Everybody knows exactly what I’m doing; there’s no hiding it. There’s a formality to the process that is very important to me. I like that I’m not just looking through the lens. I’m able to interact with the person as I make the picture. Ebony Ray says that your photographs convey “a silence that seems to be at odds with a metropolis where blaring horns compete with each other. . .” Could you comment further on that? McPhee I love the sound of Kolkata. There is, of course, very beautiful classical Indian music in the city; but for me, the music of Kolkata is in the streets. Just everyday sound coming from the streets is very musical. But it’s also great to experience silence, and I wanted that to be part of the photographs. It’s also something else that works against the preconceptions of India in some way. I wanted the pictures to show a place that can be very peaceful. I’d hoped that it would allow people to have a sense of their own individual contemplation on the material world. Ebony What do you think of the changes that Kolkata is undergoing now? In your opinion, what does the future hold for the city? McPhee That’s a difficult question. I do think that there are certain forces at work in the city that are trying to bring about change. There are people whose interests are for the greater common good. I think that in recent years there’s more commitment to the city’s culture. Calcutta is developing so rapidly now, it’s crazy. There are vast building projects everywhere; it’s beginning to look like “Blade Runner.” The changes have been dramatic just in the past seventeen years since I’ve been coming here. There were hardly any supermarkets or department stores. Now they’re all over the place. There used to be rice paddies along the roads leading to the city. Now those areas are all built over with concrete housing blocks and shopping centers. What was once the country has suddenly become the city. Ebony Do your photos convey for Bengalis a sense of history and pride in a place that faces intense and rapid modernization and redevelopment? Is your work an urgent call to conserve the area’s heritage and cultural legacy? McPhee I hope that in some small way making photographs that celebrate the cultural heritage of the city and its people will encourage others to take that heritage more seriously, and try to protect it—especially in the area of architecture. There are organizations working on that now, and I hope to contribute in some way toward those efforts. Ebony What are you working on now? What is next for you as an artist? McPhee I came to Calcutta this time to see if there is anything else I wanted to do here. I’ve also been working quite a lot in the American West, on landscape photographs mostly. The work in India was something of a departure for me. I’ve been thinking a lot about environmental change, focused on fracking and mining. I’m thinking about those developments in the U.S., and where we’re headed. David Ebony is currently a Contributing Editor of Art in America magazine. Among his books are Anselm Reyle: Mystic Silver (2012); Carlo Maria Mariani in the 21st Century (2011); Emily Mason (2006); Botero: Abu Ghraib (2006); Craigie Horsfield: Relation (2005); and Graham Sutherland: A Retrospective (1998). He lives and works in New York City. 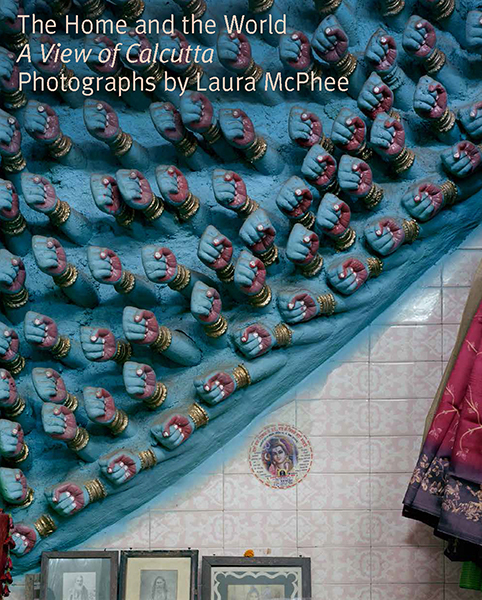 Laura McPhee is a professor of photography at the Massachusetts College of Art and Design, Boston, and has published her work extensively. Her previous books include River of No Return (Yale).